John McCain and Rick Davis (left). 2007. Stephan Savoia/Associated Press. Yesterday McCain and his campaign attacked The New York Times, claiming McCain's campaign manager, Rick Davis, had not been a consultant to Freddie Mac or paid by them in years, and that The New York Times was in the tank -- liberal paper -- for Obama. Not only is The Times running the story of Mr. Davis' firm taking $30,000 a month on Page 1 AND running the NEWS ALERT so EVERYONE will see the story, The Times also on Page 1 is running how Freddie Mac and Fannie Mae are being investigated by the Federal Bureau of Investigation. McCain is a LIAR. Remember the Keating Five? We do. Rick Davis, McCain's campaign manager got $30,000 a month till weeks ago for helping destroy the U.S. economy and steal YOUR MONEY, HOME, PENSION, 401K, and REAL ESTATE PORTFOLIO. Then McCain and Davis LIED and tried blaming the press because they have nothing else left (they won't even let television cameras in the room when Palin meets with U.N. ambassadors, she's so incompetent; so CNN walked away.) The FBI are investigating Davis for his actions. We'd call both McCain and Davis assholes if we didn't have too much class. Call us liars will you? BITE ME. We've been journalists almost as long as you've been alive, old man. If you weren't dying of cancer which you're also lying about, you might have remembered that, before being so stupid and short-tempered as to lie and attack us and think you had even a remote chance in hell of pulling it off. Also, speaking of pulling it off... where IS Vicki Iseman? 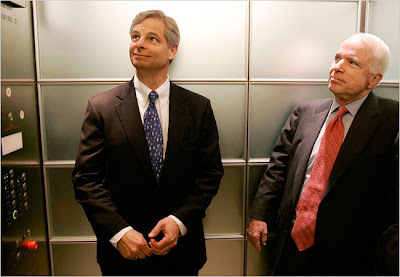 WASHINGTON — One of the giant mortgage companies at the heart of the credit crisis paid $15,000 a month from the end of 2005 through last month to a firm owned by Senator John McCain’s campaign manager, according to two people with direct knowledge of the arrangement. The disclosure undercuts a remark by Mr. McCain on Sunday night that the campaign manager, Rick Davis, had had no involvement with the company for the last several years. Mr. Davis’s firm received the payments from the company, Freddie Mac, until it was taken over by the government this month along with Fannie Mae, the other big mortgage lender whose deteriorating finances helped precipitate the cascading problems on Wall Street, the two people said. They said they did not recall Mr. Davis’s doing much substantive work for the company in return for the money, other than to speak to a political action committee of high-ranking employees in October 2006 on the approaching midterm Congressional elections. They said Mr. Davis’s firm, Davis Manafort, had been kept on the payroll because of his close ties to Mr. McCain, the Republican presidential nominee, who by 2006 was widely expected to run again for the White House. Mr. Davis took a leave from Davis Manafort for the presidential campaign, but as an equity holder continues to benefit from its income. No one at Davis Manafort other than Mr. Davis was involved in efforts on Freddie Mac’s behalf, the people familiar with the arrangement said. A Freddie Mac spokeswoman said the company would not comment. Jill Hazelbaker, a spokeswoman for the McCain campaign, did not dispute the payments to Mr. Davis’s firm. But she said that Mr. Davis had stopped taking a salary from the firm by the end of 2006 and that his work did not affect Mr. McCain. “Senator McCain’s positions on policy matters are based upon what he believes to be in the public interest,” Ms. Hazelbaker said in a written statement. The disclosure comes at a time when Mr. McCain and his Democratic rival, Senator Barack Obama, are sparring over ties to lobbyists and special interests, seeking political advantage in a campaign being reshaped by the financial crisis and the plan to bail out investment firms. Mr. McCain’s campaign has been attacking Mr. Obama for ties to former officials of the mortgage giants, both of which have a long history of cultivating Democratic and Republican allies alike to fend off efforts to restrict their activities. Mr. McCain has been running a television advertisement suggesting that Mr. Obama takes advice on housing issues from Franklin D. Raines, former chief executive of Fannie Mae, a contention denied by Mr. Raines and the Obama campaign. Freddie Mac’s payments of roughly $500,000 to Davis Manafort, the people familiar with the arrangement said, began in late 2005, immediately after Freddie Mac and Fannie Mae disbanded an advocacy coalition that they had set up and hired Mr. Davis to run. From 2000 to the end of 2005, Mr. Davis received nearly $2 million [ed: bold added] as president of the coalition, the Homeownership Alliance, which the companies created to help them oppose new regulations and protect their status as federally chartered companies with implicit government backing. That status let them borrow cheaply, helping to fuel rapid growth but also their increased purchases of the risky mortgage securities that proved to be their downfall. Such assertions, along with McCain campaign television advertisements tying Mr. Obama to former Fannie Mae chiefs, have riled current and former officials of the two companies and provoked them to volunteer rebuttals. The two people with direct knowledge of Freddie Mac’s post-2005 contract with Mr. Davis spoke on condition of anonymity. Four outside consultants — three Democrats and a Republican, also speaking on condition of anonymity — said the arrangement was widely known among people involved in Freddie Mac’s efforts to influence policy makers. Four outside consultants — three Democrats and a Republican, also speaking on condition of anonymity — said the arrangement was widely known among people involved in Freddie Mac’s efforts to influence policy makers. Mr. Davis received nearly $2 million to help them oppose new regulations and protect their status. That status let them borrow cheaply, helping to fuel rapid growth. Four outside consultants said the arrangement was widely known. McCain IS A RECKLESS PATHOLOGICAL LIAR. McCain lives purely right now, now, now. let alone what other people's opinions are. his staff lies also. Lies lies lies. McCain says ANYTHING to get people off his back NOW. Imagine McCain in the Situation Room. Seriously. McCain will do ANYTHING, say anything, promise anything, lie about anything. John McCain is not trustworthy. The New York Times called Senator John McCain (R-AZ) a LIAR. Page 1 above the fold.